The foundation of this Order had, in fact, preceded the former, which was conferred, in 1835, upon sixteen hundred and two Belgian citizens who had taken an active part in the Revolution, many of whom had previously received the iron medal (No. 9). The form and inscription of the Cross are represented No. 7 (front), and No. 8 (reverse). 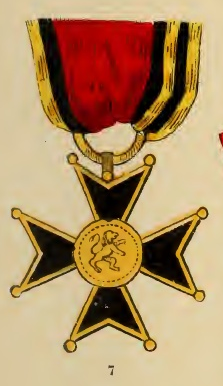 It is worn suspended by a red watered ribbon, with black and yellow borders. The above-mentioned medal shows upon the obverse the Belgian Lion with the inscription, "Aux defenseurs de la patrie" (To the defenders of the fatherland), and upon the reverse, the year 1830 in the centre of the sun, which is encompassed by the arms of the nine Belgian provinces, and the inscription, "Independance de la Belgique" (Independence of Belgium).